Naumes Fruit Gifts is a company that sells all kinds of food products including pears, appetizers, grilling products, etc. I chose to review the Suncrest Appetizers which includes summer sausage, nuts, a small cutting board and knife, bruschetta, lemon pesto, and blue cheese walnut fig crackers. Typically, I would have chosen the fruit to review but these products sounded so unique that I wanted to test them out. This kit retails for $39.95. I brought them to my parent's house so that everyone could try them. My favorite was the crackers. You could taste the blue cheese, walnuts, and figs which amazed me. My parents really liked the pesto and bruschetta. They throught that they had a lot of flavor. The coolest part about this company is that for every gift you purchase, they will donate pound for pound that amount of fruit to a local food bank. This is a wonderful cause that helps people in need! The giveaway will be for the Suncrest Appetizer Set from Naumes Fruit Gifts (a $39.95 value)! The giveaway is open until Midnight on Tuesday March 1st. Winner will be chosen on Wednesday March 2nd using Random.org. Visit the Naumes Fruit Gifts website and let me know what you would most like to try. -Like Donate Fruit on Facebook (2 entries). The Gourmet Harvest Sampler sounds wonderful! I "liked" Naumes Fruit Gifts on facebook. The Perfect Pear gift package looks scrumptious. Foothills Tapas. So easy for a party appetizer spread! The Harvest Sampler Gift Set also looks delicious to me! I would like to try the Rogue red pairs. I would like to try the pears or the Pacific Northwest Coffee Gift Set. The Foothills Tapas collection looks wonderful! So do all the pears, they look so juicy! i want to try the pesto! i'd like to try the red pears! The Rogue Gourmet Grill and BBQ sounds yummy. I really like the Harvest Sampler. I'd love to try the Pacific NW Brewed Awakenings. Thanks for the review and giveaway! Id love to try the Pacific Northwest coffee set. I'd love to try the Pear Infusions to make cocktails. I would like to try the gourmet bbq set. I entered the obol giveaway. I would like the Suncrest Appetizers - Gourmet Gift Collection. We aren't even Ducks fans but the Ultimate GO Ducks! Tailgater has so many things in it that I would love to try! luv to try their Comice pears. entered your super protein bakery giveaway. I'd love to try the Foothills tapas. The Foothills Tapas - Gourmet Gift Box looks wonderful. alread subscribe to your blog via email. I'd like the Pacfic NW Brewed Awakenings Basket, I love coffee! 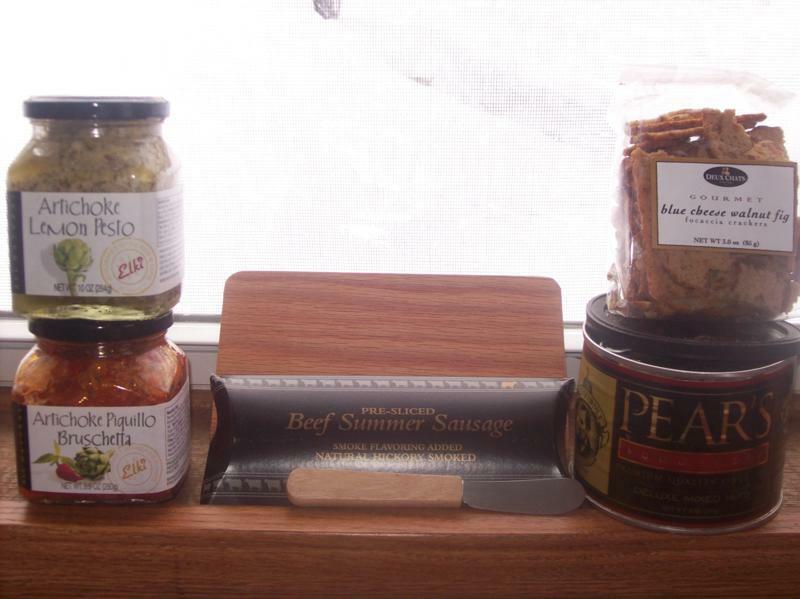 I would like to have the Foothills Tapas Gourmet Gift Box from Naumes Fruit. I'd try the Gourmet Harvest Sampler. It sounds delicious! I like the red rogue pears. Thanks! The Rogue Gourmet Grill and BBQ sounds great! I would like the Rogue Gourmet Grill & BBQ. I would love to try the Foothills Tapas Package! I would like to try the Harvest Sampler. I would most like to try the Rogue Red and Comice Pear Fruit Box. I would love to try the Comice Pears. I am a fan of Donate Fruit via Facebook as Jill Myrick. I would love to try the Harvest Sampler! I would like to try the Colossal Comice Pears!